Most Terrazzo floors are a combination of marble chips mixed into Portland concrete cement, and all concrete is not the same. Your local Terrazzo restoration contractor will be able to determine what steps need to be taken in order to successfully undertake your Terrazzo floor restoration project, this should not be confused with marble polishing they are similar but two different things. Also know, there are different concrete mixes for walls, floors, and sidewalk and driveway patching jobs, and it takes years of experience to recognize the difference when cleaning terrazzo floors. Concrete made for terrazzo varies, most mistakes are made from not recognizing the hidden details of your terrazzo floors and this can lead to increased costs in repairing terrazzo, sometimes a professional diamond grinding machine is all that's needed when polishing terrazzo floors. If you're one of the many who've tried to clean your terrazzo floors and ended up with a dirty yellowish haze, notice increased pitting or any other problems, then stop what you're doing and call a professional. 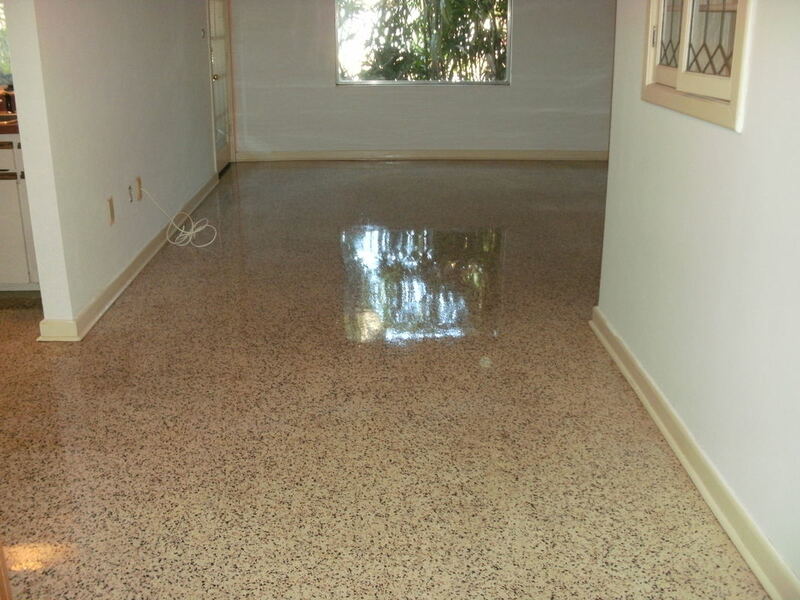 At Crystal Cleaners we can repair most mistakes and polish your terrazzo floors back to new. Even the best over the counter cleaners can't compare with a good terrazzo restoration polishing, these diamond fitted machines will bring back that high glowing shine you're really aiming for. Bringing back the shine on your terrazzo floors is a mechanical process, and unless you have a professional grade machine fitted with diamond bits hanging around the garage, you're not going to be happy with the final results of your floor. We also specialize in Terrazzo Tack Strip Repairs, Terrazzo Crack Repair and grout cleaning if you found terrazzo under your old rugs. With today's advancement in natural stone floor & concrete polishing machinery, Professional Terrazzo Polishing Contractors are more affordable now than ever before. Okay so you want to bring your floors back to life, and you tried everything you could to get them to look great but nothing seems to work. At some point you have to realize that the reasons why a professional terrazzo polishing contractor gets such great results is because he has the big terrazzo polishing machines. A pro also knows how to handle one of these big terrazzo polishing machines, I wouldn’t recommend learning how to use one of these on your own. A heavy motor can create some incredible torque and when these machines take off, they break everything in in their path, including people. Did I forget to mention what a runaway machine can do to your floor? Polishing a terrazzo floor gives the surface a brand new face, and can even remove some of the staining that you are unable to scrub off. Terrazzo polishing is the green way to go when updating your floors look with no harmful chemicals; and when it’s finished, you can clean your floors with a wet mop or cloth, there is very little maintenance with a professionally polished terrazzo floor. There is no better surface for floors than terrazzo flooring, and it's one of the top 3 selling features of any home on the market!